The CLRC's spring 1993 newsletter, our first one. Photo by Alina Ivette Fernandez. From 2015 through 2017, a dedicated and exceptional group of students in the CLRC's Undergraduate Research Apprenticeship Program (URAP) established Nuestras Historias, the CLRC archive. Led by CLRC Graduate Student Researcher (GSR) and LALS graduate student, Alina Ivette Fernandez, this multi-phase project trained students in archival construction, archival, oral history, and digital humanities methods, digital storytelling, and exhibition curation. Above all, our GSRs and undergraduate researchers learned about the relationship of the archive to understandings of the past and future, as well as about the important role the CLRC has played and will continue to play in the life of our campus. The first phase of this project (fall 2015) coincided with UC Santa Cruz's 50th anniversary celebration. Alina and our undergraduate researchers created an inventory of the CLRC’s diverse materials, such as posters, working papers, grant applications, and newsletters (like the one pictured above), thereby gaining insight into how to select items for preservation based on their historical, institutional, cultural, and evidentiary value. The CLRC's materials were transported to Special Collections and Archives at McHenry Library in June of 2016 and are now a tangible part of the history of our campus. The second phase (winter 2016) concentrated on collecting and preserving oral histories. Under the supervision of Gabriela Arredondo, Associate Professor of Latin American and Latino Studies, Alina and the undergraduate researchers learned about the role institutional memory plays in an archive and interviewed key players in the founding and growth of the CLRC. Interviews they conducted are now available at the Nuestras Historias website. During the project's third phase (spring and fall 2016), Alina and her team of undergraduate researchers learned how to present material in a clear and compelling manner to a general audience by building a WordPress site. We were thrilled to see Nuestra Historias go live in January 2017. Finally, over the fall of 2017, CLRC GSR and LALS graduate student, Mauricio Ramírez, CLRC undergraduate intern, Alma Villa, and CLRC director, Catherine Ramírez, worked with Teresa Mora and Jessica Pigza of Special Collections and Archives in curating an exhibit about the CLRC. 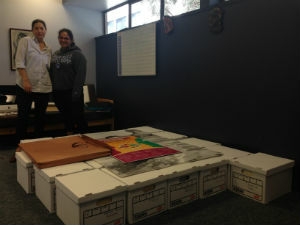 The exhibit features materials culled from the 27 boxes and three oversize folders comprising the CLRC archive. It helps mark the CLRC's silver anniversary and will be on display at Special Collections and Archives on the third floor of McHenry Library November 30-December 15, 2017. Nuestras Historias has benefited from the support and guidance of Rachel Deblinger, Digital Scholarship Commons director; Melissa De Witte, Digital Communications Manager of the Division of Social Sciences; Kate Dundon, Archivist; Teresa Mora, University Archivist; Jessica Pigza, Outreach and Exhibits Librarian; Jacquelyn Powell, CLRC Program Manager; and Beth Remak-Honnef, Head of Special Collections and Archives. Before arriving at UC Santa Cruz, Esteban attended San Gorgonio High School in San Bernardino, CA. Once he began his undergraduate journey, he got involved in several research projects, most notably Working for Dignity. He was part of the cohort of CLRC apprentices to survey low-wage workers in the city of Santa Cruz in the winter of 2014 under the leadership of Professor Steve McKay and Sociology PhD candidate Ruben Espinoza. He continued to participate in the Working for Dignity project by taking Work and Society (Sociology 176A), in which he learned to conduct in-depth interviews. Doing hands-on research in Working for Dignity sparked his interest in how language matters in the workplace. In the fall of 2015, he began writing his senior thesis, "Why the Linguistic Division of Labor Matters in the Santa Cruz Workplace." Vicente is a first-year Cowell College affiliate who plans to pursue a combined major in Latin American and Latino Studies and Politics. His research interests include transnational political discourse, Latino representation in higher education, and the rights of undocumented people. In addition to watching Tarantino films and campaigning for Democrats, his greatest passion is having conversations with his tightly knit family over hearty meals. Cinthya is passionate about educating immigrants about their civil and human rights and encouraging youth to pursue a higher education. Inspired by her experience as president of We B.U.I.L.D (Bringing Unity to Immigrants and Life to their Dreams), she interned with Neighborhood Legal Services in Los Angeles County, where she conducted research on immigration law and the legal rights of immigrant victims of domestic violence. She holds an Associate Degree in Social and Behavioral Sciences from Los Angeles Pierce College, aspires to do more research on immigration law, undocumented worker rights, and Latino/a youth civic and political engagement, and is considering a career in law. Before arriving at UC Santa Cruz in the fall of 2015, Alma attended El Camino College Compton Center, where she received her Associate Degree in Social and Behavioral Sciences. Winner of the 2016 Blum Scholar Grant, Joel Frankel Award, STARS Re-entry Scholarship, and Weiss Family Scholarship, she is researching precarious housing among Latinos in Southern California, with a focus on the impact of the current housing crisis on low-income Latinos in Los Angeles. In addition to participating in Nuestras Historias, she is the CLRC's Professional Career Development Program Intern.